The Newtown Historical Society was founded to educate the public about the history of the villages that comprised Newtown Township in Queens County, NY. Newtown Township stretched from the East River to the Flushing River. Towns covered include: Maspeth, Elmhurst, East Elmhurst, Middle Village, Glendale, Ridgewood, Forest Hills, Rego Park, Woodside, Jackson Heights and Corona. Victory! Ridgewood Reservoir is permanently protected! The Ridgewood Reservoir in Highland Park has officially been designated a wetland by the NYS DEC after 11 years of advocacy by a coalition of environmental and historic preservation activists. Here is a link to a copy the official declaration. The order was signed by DEC on October 24, 2018 although the Queens Parks Commissioner was not made aware of it until late December. This is a huge victory for all of us who advocated for protection as well as park goers who enjoy visiting the Reservoir. There are dozens of individuals and organizations that deserve credit for this, especially Queens Community Board 5, who was on board from the beginning, but for a concise history of who did what and when, please see Page 8 of The Clapper Rail. The Bloomberg Administration, under its PlaNYC 2030 initiative wanted to spend $40 million to turn Highland Park into a "destination park" by removing the natural habitats and replacing them with active recreation. An opposition effort was spearheaded in 2007 by birders and artists, mainly from Brooklyn. They grew a coalition that included organizations such as Newtown Historical Society and NYC Park Advocates as well as heavy hitters like NYC Audubon and Riverkeeper. Comptroller William Thompson and Robert F. Kennedy, Jr.'s 2008 NY Times op-ed raised the visibility of the reservoir's predicament citywide. 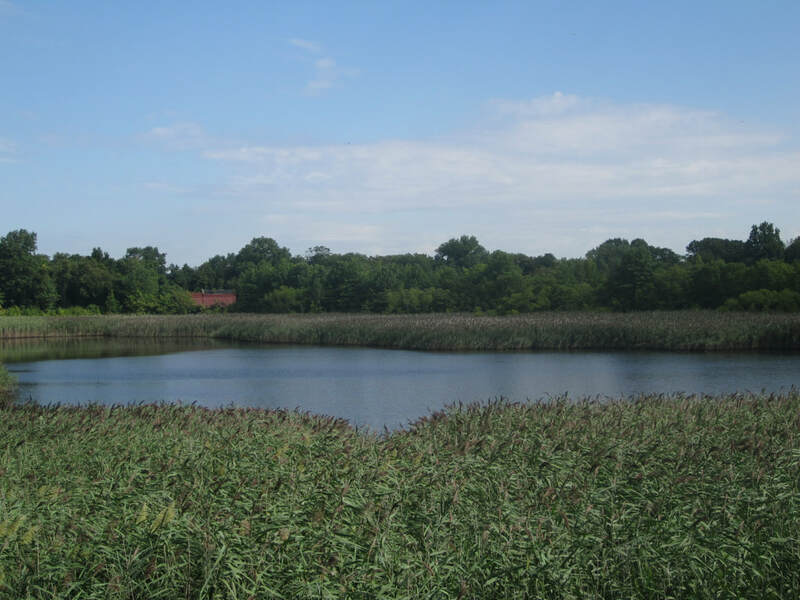 In 2009, certified wetlands delineator Mickey Cohen volunteered to map the wetlands inside the Ridgewood Reservoir basins for the Highland Park-Ridgewood Reservoir Alliance (previously known as the Ridgewood Reservoir Education & Preservation Project) and wrote a detailed report. A review of the activists' 2010 application to the DEC was delayed due to Hurricane Sandy and other environmental issues in the state. DEC later claimed each basin was an individual wetland, each of which were too small to meet the criteria for designation. A lack of funding caused Parks to abandon their development plan, but they proceeded with phase 1 and 2 of restoration of the paths around the perimeter and between basins 2 and 3. Historic preservation and natural conservation eventually won over, but the DEC had the reservoir classified as a "high-hazard" dam, and the Parks Dept then was put in the position of having to breach the walls of the basins in order to comply with DEC's safety regulations, which would have put the habitats in peril. In 2014, the Parks Dept requested that the DEC reclassify the reservoir as a "low hazard" dam, and in 2017 then-Queens Parks Commissioner Dorothy Lewandowski announced that she completed the application to accomplish that, which eliminated the need to alter the walls of the basins. In November 2017, Basil Seggos wrote to Assembly Member Cathy Nolan to explain that there was another criteria that could be used to designate the Reservoir as wetlands. The basins' "unusual local importance" made them eligible. A hearing was held and the comment period ended in March of last year. Then, it was just a matter of waiting for final approval. The Newtown Historical Society is proud to have been a part of this amazing effort. We believe that environmentalism and historic preservation go hand-in-hand. We are still looking forward to seeing the pathway between basins 1 and 2 restored and for the invasive species within the basins to be replaced with native plants, and hope the gatehouse and pumphouse will someday be restored, but now is a time to celebrate achieving a long-sought victory. 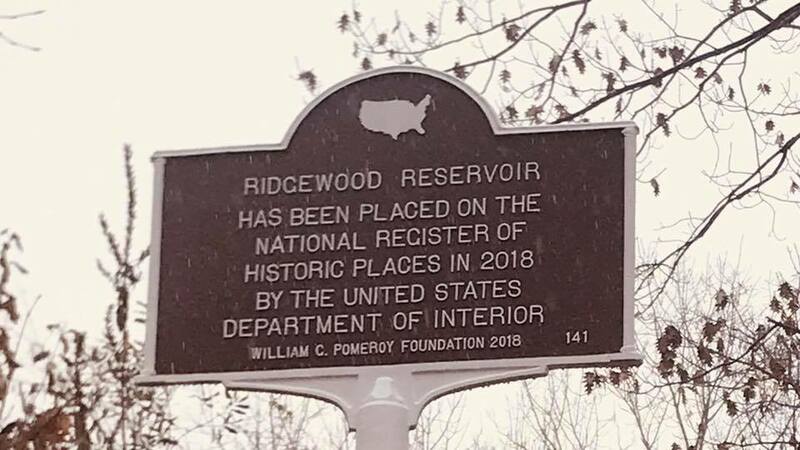 The National Register marker that was granted to NHS by the William C. Pomeroy Foundation has been installed next to the main steps at the Ridgewood Reservoir. Thank you to NYC Parks for working with us to get this done! 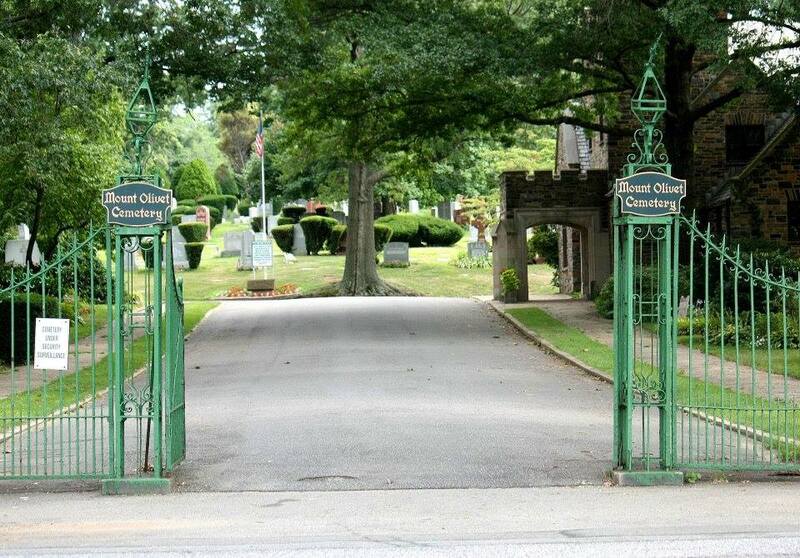 Maxine Fisher has arranged a free nature tour of Mount Olivet Cemetery on Saturday, October 6th at 9am. Expert birder Rob Jett will lead the tour. It should be a great day to see all kinds of nature in action from birds to trees to insects. RSVP not required. Meet outside the main cemetery office at 65-40 Grand Avenue. ​Rain date: Saturday, October 13th at 9am. 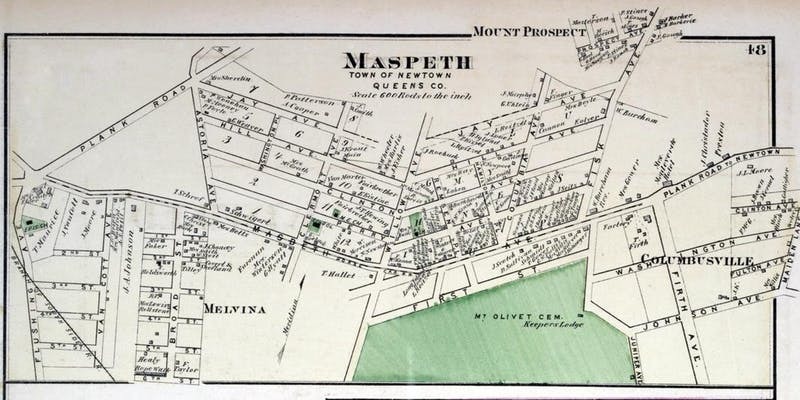 Join NHS' Christina Wilkinson and Kevin Walsh, author of "Forgotten-NY" on a walk through the town of Maspeth, the oldest European settlement on Long Island. Learn about the history of the area from pre-colonial times to the present. Optional group lunch at end of tour not included in cost. Rain date is September 23rd at 10am. $5 on day of tour or pay by credit card in advance on Eventbrite. Please RSVP to newtownhistory@gmail.com. Join Kevin Walsh of Forgotten New York and Mitch Waxman of the Newtown Pentacle as they take us along the border of Brooklyn and Queens through Bushwick and Ridgewood. We'll make stops at English Kills and an historic colonial Dutch home as well as other fun and quirky locations. End with an optional dinner on Myrtle Ave before heading back to the Myrtle-Wyckoff subway station. Tix are only $5, so reserve your space today! The year 2017 is the 375th Anniversary of the founding of the town by English Puritans under a Dutch patent. We have dedicated a section of our site to Maspeth history in honor of the occasion. Please click on "Maspeth history" on the menu bar to the left. Some articles are taken from other sources, but most are written after extensive research. ​Join naturalist Rob Jett and Christina Wilkinson of the Newtown Historical Society on a walk through Mount Olivet Cemetery. We will observe the natural environment, including birds, butterflies, plants and trees and discuss the history of the cemetery, it's role in the development of Maspeth and visit the graves of noteworthy people who are buried there. Meet up in front of the cemetery office at 9am. Bring binoculars and wear comfortable shoes. Terrain is hilly. 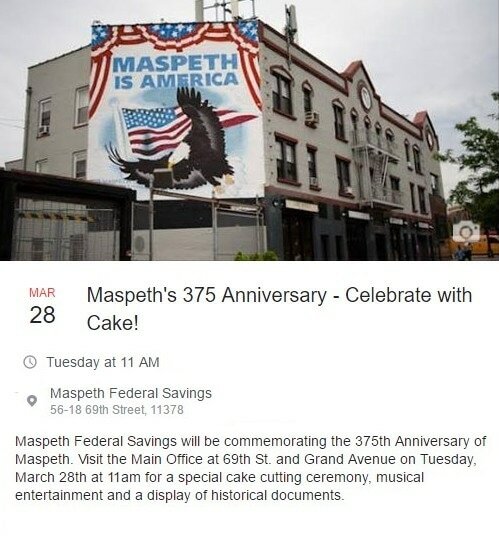 These events are part of the 375th anniversary celebration of Maspeth and are free. 2017 is the 375th Anniversary of the founding of Maspeth by English settlers under a Dutch grant. We will be celebrating this throughout the year with historical displays, ceremonies and community events. The first event takes place Tuesday, March 28th at 11am at Maspeth Federal Savings. There NHS will be presenting historical photos of Maspeth and a copy of the original charter from 1642. There will also be music and a cake! Event is free and open to the public. The Juniper Park Civic Association, Maspeth Federal Savings, Newtown Historical Society and the Knockdown Center are pleased to present a Polish Music Festival on Sunday April 9th. Doors will open at 2pm and the performance starts at 3pm. We will not only be entertained by Polka King Jimmy Sturr, but will also enjoy a performance by the Wianek Polish Folk Dancers from St. Margaret's Church. This event is free, but we will be offering raffle tickets and a cash bar. Middle Village turns 200 in 2016 and we will be touring the town! All events are free. 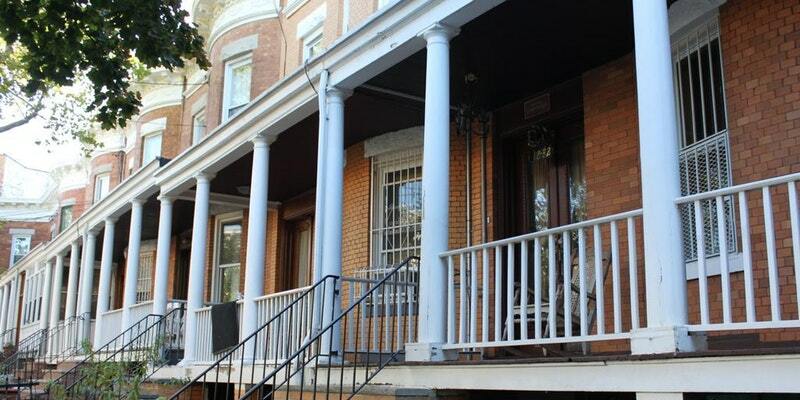 September 25: Middle Village Walking Tour. Meet at the large flagpole in Juniper Valley Park at 12 noon. October 8: All Faiths Nature and History Tour. Meet at the All Faiths Cemetery Office at 9am. Co-led by Rob Jett, author of the City Birder blog. November 19: We will tour the Fresh Pond Crematory, built in 1884 starting at 3:30pm. Refreshments will be provided. This event is free. Address: 61-40 Mount Olivet Crescent. Please reserve by calling (718) 366-3715 or writing to newtownhistory@gmail.com. Restoration of Ridgewood Plateau arches complete! The Newtown Historical Society and Juniper Civic, with funding provided by Maspeth Federal Savings and O'Neill's restaurant, have completed the restoration of the Ridgewood Plateau arches! You can read more about it here. The Newtown Historical Society and NYC Parks Department are proud to announce the restoration of the Captain Malcolm A. Rafferty Monument at the Rafferty Triangle in Long Island City. The collaborative effort has restored the medals that had been removed from the stone in years past. Captain Malcolm A. Rafferty, of Long Island City, was a decorated hero of the Spanish-American War and specifically, the Battle of San Juan Hill. After the war, he returned to LIC to work for the Barber Asphalt Company. Trouble soon broke out in Trinidad between the asphalt company, a rival company and the Venezuelan government, and Rafferty and a group of LIC men that he had recruited were sent to protect the interests of their employer. He contracted malaria in Trinidad and passed away in 1903. He is interred in Woodlawn Cemetery. The Rafferty Triangle was dedicated in 1932 at the intersection of 44th Drive and Hunter Street and the monument was dedicated on Memorial Day, 1937. Over the years, the monument became the victim of vandalism, and two bronze Spanish-American War Crosses were removed from its front and back. The Newtown Historical Society funded the purchase of the replacement medals and the Parks Department installed them on the monument on December 5, 2014. 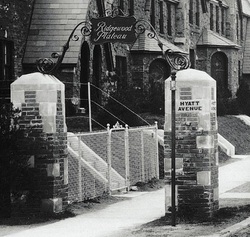 This project is the second restoration effort undertaken by NHS in 2014; the first being the Ridgewood Plateau arches in Maspeth. Help us fundraise simply by shopping! Newtown Historical Society participates in AmazonSmile. Choose us as your favorite charity and a percentage of what you spend will be donated to us. 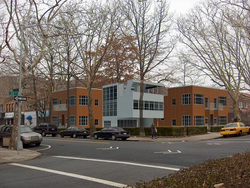 The Aluminaire House, a 1930s-era experimental home, was proposed for placement in Sunnyside Gardens. Newtown Historical Society opposed this in a letter to the Landmarks Preservation Commission due to the building being out of context in the surrounding historic district. The proposal was voted down by the board in January 2014. Newtown Historical Society is a member of "Save Flushing Meadows-Corona Park," a coalition of groups opposed to the commercial encroachment of Flushing Meadows-Corona Park. Current plans call for development of a shopping mall within the confines of the park. Learn more by visiting savefmcp.org and watching the video below. 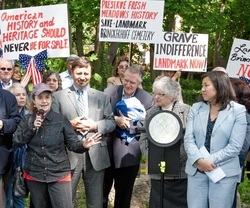 The Newtown Historical Society stands with the Fresh Meadows Homeowners Civic Association and other civic and preservation organizations across the borough in opposition of the proposed de-calendaring of the Brinckerhoff Cemetery by the Landmarks Preservation Commission. The cemetery holds the remains of some of the earliest settlers of Queens and, as an important historical reminder of our borough’s past, has been designated an official NYC landmark. However, designation is not enough to ensure preservation. Therefore, NHS calls on the elected officials representing the Fresh Meadows area, the Queens Borough President and Queens delegation of the City Council, to allocate funding toward purchase of the property and return ownership to the City. The property cost $100,000 to purchase in 2000, but that opportunity was unfortunately not capitalized upon. Over the course of the following 10 years, no funding was allocated for this purpose, although elected officials went on record during that time to claim that they supported public ownership of the land as a park or historic site. The property was sold in 2010 for $105,000 – an increase in price of only $5,000 after 10 years. Surely, most - if not all - of this funding can be raised during the City’s upcoming June budget cycle to purchase the property from the current owner and assure that this land is forever saved from the threat of development. The Queens delegation recently allocated a lump sum of $3M toward purchase of a schoolyard in Jackson Heights for part-time use as a park. It is time for Queens’ elected officials to step up to the plate and put their money where their mouths are so we will not need any more hearings or rallies to push for a solution which should have come to pass decades ago. Brinckerhoff Cemetery was also once known as "Black Stump Cemetery" and is located at 69-65 182nd Street in Fresh Meadows, Queens (not to be confused with the Black Stump Cemetery that became St. Mary's Cemetery).